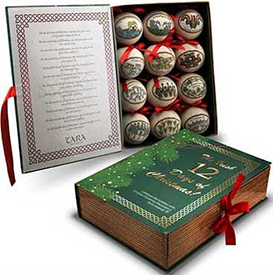 The Irish Gift House: Nollaig na mBean - Women's Christmas! Nollaig na mBean - Women's Christmas! January 6 is the Feast Day of the Epiphany which marks the end of the twelve days of the Christmas Season. The season starts with the revelation of Christ to Israel in His birth on Christmas Day and ended with the revelation of Christ to the Gentiles with the visit of the Three Wise Men or Magi at Epiphany. In Ireland, Epiphany is also known as Nollaig na mBean, which translates from the Irish language to Women's Christmas in English. On this day women are not responsible for doing any of the housework, taking care of the children or cooking the family meal. The women traditionally meet at each other's homes for some relaxation and socializing that includes food and drinks. The meals would tend to be baked delicacies such as scones and cream cakes, washed down with a nice pot of tea or maybe something a little bit stronger. after the house and children. Ladies, The Irish Gift House hopes that you enjoy your day!